In just four weeks, the 2:46 Quakebook project turned an idea first voiced in a single tweet, into a rich collection of essays, artwork and photographs submitted by indivdiuals around the world, including people who endured the disaster and journalists who covered it. 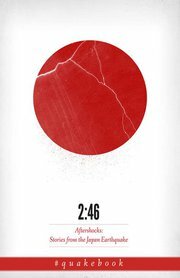 2:46: Aftershocks: Stories from the Japan Earthquake contains a piece by Yoko Ono, and work created specifically for the book by authors William Gibson, Barry Eisler and Jake Adelstein. The Kindle ebook is available for free from anywhere in the world at Amazon.com or Amazon.co.uk. You don’t even need a Kindle. Just go to the order page and download (for free) a Kindle reader for your Mac, PC or smart phone. The download itself is free, but we ask that you make a donation to the Red Cross using the link provided on the product page. How much should you donate? We leave that up to you. If you can spare a lot, give a lot. If you can’t – we understand, give what you can. You can now order the Japanese – English print-on-demand bilingual print edition from Amazon, Barnes and Noble or the Book Depository (with free shipping worldwide). Stay up to date on the latest news using the Twitter hashtag #quakebook or through the news updates below.